The more I look at Tuesday’s election the less certain I am that it predicts anything for the general. Three months in politics is an eternity anyway, but the submariner low turnout compounds the mystery. If Kitsap County does only see 15,000 more votes by the end of this election, turnout that was expected to be about 50 percent will finish lower than 35 percent. The general election should see more than double that. My gut tells me this means Democrats have work to do keep their wins around here. My gut often doesn’t know what it’s talking about, but nobody had a chance to vote against Barack Obama Tuesday. In November they will. Fortunately for Democrats they ended Tuesday with some big leads in some races, so they start ahead. And in the general election of 2010 Democrats in Washington did very well in getting out the vote. While Republicans swept the nation, Democrats held their own here. What I’m interested in seeing over the next few days is how the later votes trend. That same 2010 general election was the first where Democrats broke the trend by winning the late votes. See today’s story in the Kitsap Sun (paper version) for an explanation of Kitsap County’s move to a self-insured health care program. A number of counties and cities around the regional have already made the switch in an effort to curb rising health care costs. The new program, combined with other cost-saving measures, is expected to reduce the amount the county spends on health care by $12.5. But the “savings” will not mean a decrease in employees’ share of insurance premiums. Employers nearly everywhere have responded to escalating health care costs by asking employees to shoulder a greater share of the burden through higher premiums and deductibles. So Kitsap County employees were not alone when they saw their premiums jump from two percent of the total cost in 2009 to eight percent in 2010. In 2012, the county pays 86 percent of the tab for premiums; employees pay 14 percent. In 2013, that’s expected to go up to 17 percent, according to Bert Furuta, director of personnel and human services. Bear in mind that the county isn’t simply shifting the burden, said John Wallen of DiMartino Associates, the county’s health care consultant. The county’s own costs continue to increase, even as it leans harder on employees to foot their portion of the bill. Nationwide, the proportion of employees’ share of premiums varies widely depending on the industry and region of the county. A recent Mercer survey that divides the county into four regions, showed that, among combined private and public sectors for the “West,” the percentage was 21 percent for single employees, 30 percent for families. 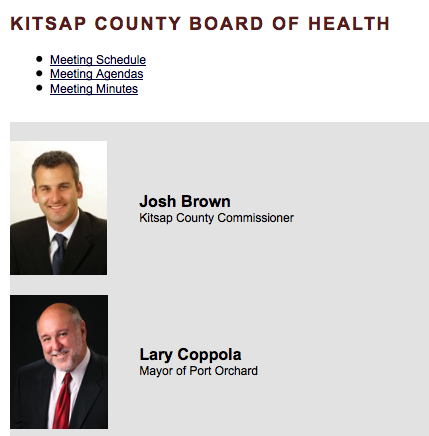 At that rate, Kitsap County employees are still ahead of the game. You may wonder — and I asked — why the county needs a health care consultant, at a current cost of just more than $40,000 per year. According to Furuta, the field of health care is so complex that it requires specialized expertise to navigate. The county tried to go without some years back and found it was not cost-effective, Furuta said. Kitsap Republicans will have a full slate of delegates and alternates when they go to the state party convention on May 31 in Tacoma. County party members met for a second time on Saturday and completed the voting process that stopped prematurely on April 21, when a nominating process ran into conflict with a commitment to be out of the Klahowya Secondary School building. State party officials informed county party leaders they could reconvene and get approval from the state convention rules committee to seat the five-dozen-plus delegates in total. If, for whatever reason, the committee were to decline, the county would be represented by 14 people. The head of that committee, however, gave assurances earlier that the full delegation would be seated. Hamilton, in his statement following the convention, makes no mention of what appears to be a brief, but boisterous, moment of dissension that was videotaped. Hamilton thanked those who attended both events. “Your sacrifice of time, energy, and money are greatly appreciated. In addition, your willingness to actively participate in our political process (with all it’s warts and glory) set you aside from most voters. As those of us who have spent far too much time chasing dreams of political success know, you are no longer a ‘normal’ person,” Hamilton wrote. The video, which apparently is against county party guidelines, shows the videographer being told to stop taping. He eventually yells that he’s being assaulted. There’s more attempting to get him to stop taping while Kirby Wilbur, state party chairman, attempts to talk to the rest of the delegates. Wilbur tells someone to “Sit down and shut up,” but I can’t tell from the video who he was addressing. A final critic offers a condemnation that makes little sense to me, only because I’m assuming the videographer is a Ron Paul supporter. “What part of the Communist Party do you belong to?” the man yelled. That insult gets lobbed all the time at Democrats, but not at libertarians. Many commenters to the video operate under the illusion that the party has to allow filming. It doesn’t. A political party is not subject to state open meeting laws, because those only apply to governments, and political parties are not governments. The state attorney general has a page on this, which gives broad explanations of when a meeting must be public. Note that “political subdivision,” which is mentioned on the page, refers to a smaller government, such as a city or county, that is subject to state law. In fact, not all government bodies are subject to open meeting laws. The Legislature wrote in exceptions for itself and for the courts. Even the government entities that are subject to the law are allowed exceptions, such as when they meet to consider a legal action or real estate transaction. Whether it’s a good idea to prohibit filming at a political event is another question. Any time someone attempts to stop it the resulting footage provides better public relations fodder than anything the videographer might have otherwise caught. The Kitsap County Republican Party, in addition to caucusing on Saturday, will hold their annual Lincoln Day dinner on Friday. Scheduled to speak to the group is Rev. Wayne Perryman, whose bio lists him as a community activist and minister. He is also a former talk-show host and has numerous videos on YouTube, including some appearances on conservative national shows. Here is a story from The Sun in 2003. Perryman was born in Bremerton, it seems. Until 2007 county commissioner meetings, the regular meetings, were in the daylight hours. Thinking they would get more participation by holding them at night they moved them to the evening. That participation, according to the commissioners, has not happened. The county has issued a press release saying the commissioners are considering changing the meeting times, but it reads as if the decision has been pretty well made. The board will reserve the right to hold special meetings at special times and in different places. The full discussion of this idea is scheduled for the board’s 7 p.m. meeting on Monday (Feb. 13). It’s that time of year, the election season is in full swing and local governments and agencies are deep in preparing budgets for the upcoming year. This week, I’ve written about revenue forecasts for Kitsap County and the city of Port Orchard. On Monday, we’ll publish a story about South Kitsap Fire & Rescue’s budget and an upcoming vote of its firefighters’ union. Below, I’ll share links to documents I collected from public officials in the course of my research, with the following disclaimer: these are (with the exception of Port Orchard’s annexation revenue worksheet) preliminary budgets subject to change. We’ll continue to report on these and other local jurisdictions as the budget process unfolds. Let me know what jumps out at you. I can’t promise we’ll address every observation or concern. But as I always say, many heads are better than one. … Enjoy! Due to a broken water main at the Island Lake Community Center, an informational meeting on redistricting of Kitsap County Commissioner district boundaries has been moved to the Silverdale Community Center (A-Frame Off of the Upper Parking Lot), 9729 Silverdale Way NW, Silverdale. The meeting will begin at 6 p.m. rather than the originally posted 6 p.m. to ensure time for people to reach the new location. State law requires the county to adjust the boundaries to roughly equalize the number of residents per district. The county’s board of commissioners will adopt the revised boundaries by the end of 2011. The boundaries become effective in 2012. One option would be to make no change to the boundaries, which were last adjusted in 2002. The difference between District 1 (“North Kitsap”), the largest district, and District 3 (“Central Kitsap”), which is the smallest, is 6,300 people, which is within allowances of the law, county officials say. A second option would reduce the difference in population to 1,200. This option would affect residents in the Olympic View area east of Highway 3 and south of Mountain View Road in Central Kitsap. A third option would result in a population difference of 1,400 and would affect people living in the area east of Silverdale Way and west of Ridgetop Boulevard. Another information meeting has been set for 6 p.m. Oct. 6 at the county administration building, 619 Division St. in Port Orchard. For more information, call (360) 337-4495. 2 p.m.: Updates on the budget, annexation and redistricting and a discussion about the trails planning scope and schedule. 7 p.m.: Employee service awards, two appointments to the Rolling Hills Golf Course Oversight Board, several contracts to provide mental health services, and a resolution issuing $21.8 million in bonds to pay off old bonds and save $1.7 million in debt service. No work study session on Wednesday. Wednesday, Sept. 28, 5 p.m.: Study session in the sixth-floor council conference room. Lone discussion item is the purchase of a sculpture planned for Pacific Avenue near Ninth Street. Tuesday, Sept. 27, 7 p.m.: Council meeting items include: DeKalb Street right-of-way request, two public works contracts and approval of a public event. Wednesday, Sept. 28, 7 p.m.: Council Workshop dedicated to proposed impact fee ordinances. Public comment is on the agenda. Monday, Sept. 26, 5:30 p.m.: 2012 budget, housing management reports and Section 8 admin plan, real estate and contract reports, election of new officers. The Age of Stupid is directed by Frannie Armstrong and stars Pete Postlethwaite. The film runs 98 minutes. There is no charge for admission, but the suggested donation is $5 per person. “The Sustainable Cinema Series was created to provide interactive and educational information to Kitsap County residents about sustainable living,” the press release says. For more information, contact Aimee Gordon Warthen, District 2 Liaison, at 360.337.7097.